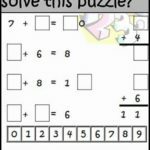 Can your students complete this puzzle? Would working on it help them build their critical thinking skills AND help them practice basic addition facts at the same time? Absolutely would. Download this Addition Tiling Puzzle for FREE from my Teachers Pay Teachers store. Fern Smith’s FREE Addition Center Game – Owl-ways Have Time for Math! Need Some New Addition Center Games For This School Year? « Christmas/Winter/Holiday/Good Job Grade Changing Pass!